If you’re looking to follow trails made up of more than just gravel—we’ve got you covered. From Racine, WI to Lemont, IL, we’ve rounded up some of the best hiking spots for adventurers who like to take the road less traveled. Check out our picks below, and we’ll see you out on the trail! If you’re looking to cover some serious ground, it doesn’t get better than Waterfall Glen Forest Preserve. Rolling hills, open savannas, and oak-maple woodlands can be seen along this 11-mile trail. Those that go the distance are rewarded with the view of a gorgeous natural waterfall. An elevation gain of about 400 feet makes this trail one of the most challenging in the area. Although often heavily trafficked, this trail features multiple trail-heads, wide paths, and restroom areas. You can plan to log some major steps while on this trail, so don’t forget your fitness tracker at home. Nestled along the Illinois/Wisconsin border, Gander Mountain is a hiker’s dream. Nearly 1,000 feet above sea-level and with an elevation gain just short of 350 feet, this trail contains the highest natural elevation in Lake County. Don’t let the 1.3-mile distance fool you; Gander Mountain’s loop trail is rated difficult and it’s forestry is often described as rough, rugged, and wild. Unlike most Lake County Forest Preserves—which are fully developed and feature basic amenities like parking lots, rest areas, and trail signs—Gander Mountain is an undeveloped trail that offers hikers endless opportunities to forge their own path. Remember to dress appropriately, maintain caution when parking on the shoulder of Wilmot Road, and check for ticks when you get home. 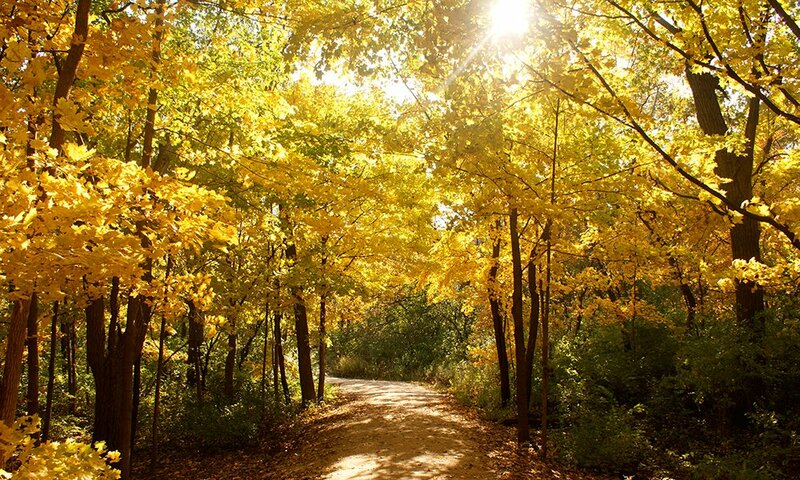 Tucked away in the woods of Racine, this 1.8-mile trail is the perfect spot for a quick hike. A complex system of trails leads you through the woods and along the Root River; follow the boardwalks along Woodduck Way to walk through the wooded marsh or take Chickadee Trail to enjoy an overlook of Duckweed Pond. There’s not much elevation gain here at just 91 feet, but the even terrain and loop-style trail provide the perfect setting for a nice hike or quick trail-run. A water bottle and bug spray should be all you need for your visit, but be sure to leave Fido at home as the Riverbend has a no-dogs-allowed rule. Glacial Park—the Conservation District’s most popular site—offers more than 8 miles of trails that see thousands of guests each year. There’s something for every type of adventurer here; whether you’re looking for a light day-hike with the kids or seeking the 187-foot elevation to train for your next backpacking trip. All visitors can expect gorgeous views during their time here, especially when climbing the Camelback Glacial Kame for a view of Nippersink Creek. Time it just right and you might even catch the sunset from the top. If you’re visiting Glacial Park for the first time, you’ll do just fine with a small bottle of water and a whole lotta bug spray. One of Lake County’s best kept secrets, Edward L. Ryerson Conservation Area is a hiking trail you’ve probably never heard of. An Illinois Forest Preserve and a historical site, Edward L. Ryerson Conservation Area Loop Trail has 6 miles of trail that wind through the woods and along the Des Plaines River. Fairly even terrain and an elevation gain of just 42 feet makes for a pretty easy hike, but be sure to load up on the bug spray first. Don’t see your favorites on here? Tell us your go-to spots in the comments below!